Twenty drivers competed in the Chinese Grand Prix, which was the 1000th race in the Formula 1 World Championship. 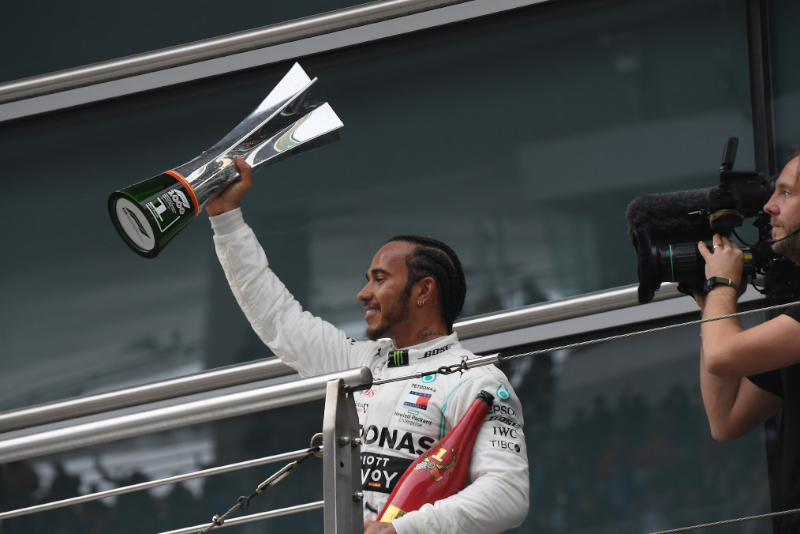 But once his Mercedes teammate Valtteri Bottas slipped up at the start, Lewis Hamilton was the one and only driver who had a shot at winning. Here's how his victory in the 1000th race unfolded. Bottas started from the pole position for the first time this year and the seventh time in his F1 career. The top ten places on the grid were filled two-by-two by five teams. Row 1: Mercedes with Bottas and Hamilton; Row 2: Ferrari with Sebastian Vettel and Charles Leclerc; Row 3: Red Bull with Max Verstappen and Pierre Gasly; Row 4: Renault with Daniel Ricciardo and Nico Hulkenberg; and Row 5: Haas with Kevin Magnussen and Nico Hulkenberg. "I'll need a good start in order to keep the lead," Bottas said after qualifying, "as I'm sure both Lewis and the Ferraris will be pushing. We've been strong all weekend long so we need to continue to perform at this level to get the job done tomorrow." Just after the red lights went out to start the 1000th race Bottas encountered a thick white start/finish line. "Lewis had a better start," Bottas said. "For me the problem was already on the formation lap start. There was a thick white line just in front of my grid box. When I went over the white line I got some wheelspin on the formation lap start. For the race start, I thought maybe it's going to be better with warmer tires but it wasn't. Once I hit the white line, got the wheelspin, took too long to recover it, lost a few meters of distance, so Lewis got me. That's how it goes sometimes." "A little bit of a struggle this weekend for me," Hamilton said, "but once I got into qualifying, a little bit of a shift in driving style enabled me to unlock a bit more potential with the car, which Valtteri was clearly able to do. And then the start was obviously great, which was really the decisive moment I'd say for the race." The Silver Arrows Mercedes pulled away from the Prancing Horse Ferraris of Leclerc and Vettel. "Overall we can't be satisfied because we were too slow today," Vettel said. "We were hoping to be in a much better place and be a match for Mercedes, but we were not." Running behind Leclerc, Vettel believed he was faster and would have a better chance at closing in on the Mercedes duo. He asked Ferrari to instruct Leclerc to let him pass. Leclerc protested that he was pulling away from Vettel. Ferrari told Leclerc to give way. Ferrari team principal Mattia Binotto said that the orders were justifiable. "Certainly it's difficult as a team to give the order because we understand the drivers; they need to battle to stay ahead as much as they can," he said. "So it was certainly not an easy decision. I have to thanks Charles. I think the way he behaved, again he's showing he's a good team player, but I think again there will be a time when the situation is reverted. As a team we need always to maximize the team points. In that respect we did the right choice." "I felt I was faster in the car," Vettel said. "I was asked if I can go faster. I answered that I felt I can. I was a bit surprised when I was in free air - not surprised but I was struggling a bit to put the laps together. Once I found a rhythm, I was able to chip away." "Both Seb and myself were struggling with the tires," Leclerc said. "We swapped positions and I thought he would have pulled away but he didn't and this didn't help my tyres because I had a bit of overheating and I lost some time." Leader Hamilton was having no such problems. "It was fairly straightforward," he said. "I managed to have quite good pace today compared to P2, practice two, long run pace, so I'm really, really happy." Bottas also had a fast car, but he was stuck in Hamilton's wake. "The car was feeling okay and the pace was similar," Bottas said, "but in the first stint, in the dirty air I couldn't follow." So there was no way Bottas could catch Hamilton, and no way that Vettel could catch Bottas. Vettel finished third - his first podium of the year. "Clearly today we were not as fast as Mercedes," he said. "There were stages in the race where we were strong, and stages of the race where we were weaker compared to where we wanted to be." Hamilton's 75th career F1 win came in the 1000th race.